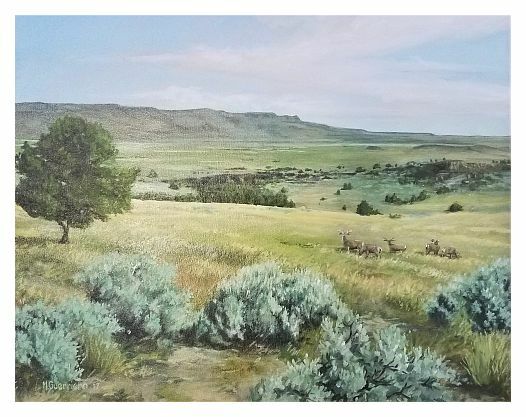 The wind, dust, and sun of the Malhour captured by Michael's acrylics from a summer trip in the area. One can feel the warmth and almost smell the sage on the breeze. Quietly remote, the deer gaze back at you and the buttes look on. Michael currently lives in Yachats, Oregon and does much traveling in the state and back to California, which he last called his home. With a blend of both realism and concept, Michael conveys ideas with bold statement, but also left up to the viewer's interpretation. The whale breaches at the Fibonacci spiral of pelagic birds while the whale's eye is in yin-yang balance. Shadows behind make one think there's more to it than meets the eye, what does it mean to you? Graphics in harmony like that of a Japanese haiku. 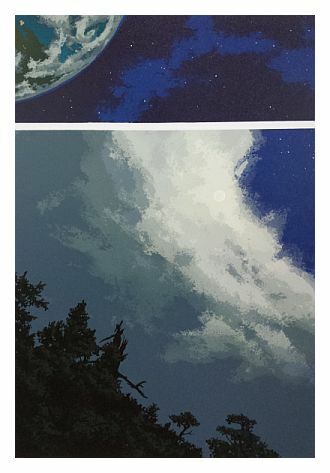 Michael uses the printing method of Serigraph to render these images in crisp detail while retaining gentle hue blends. Michael uses a series of screens to print his limited edition Serigraphs. Each screen is hand painted for each registration of color. These build the image slowly and each registration is completed in the edition before the next starts. For more explanation of the Serigraph process, Michael kindly left pieces that help illustrate his method at the Ozone. Feel free to ask to see them when at the gallery. In addition to the Acrylics and Serigraphs, visit Michael's sculptures in metal, found objects, and found woods.